Linhof Master Digi Repro System reprographic stand, a professional copy stand for studio photography, with Linhof Techno camera. 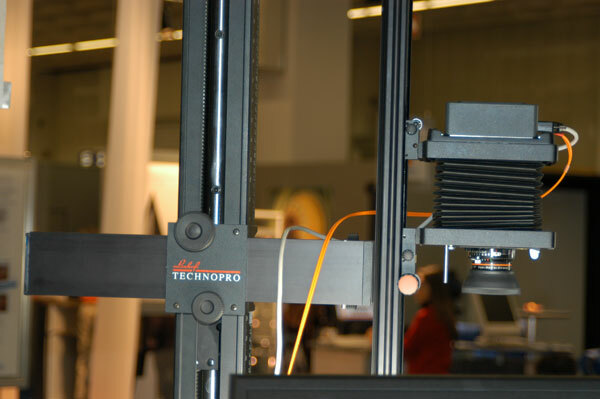 Linhof TechnoPro reprographic stand at Photokina 2002. I classify desktop camera stands as copy stands, and serious professional systems as repro stands (reprographic stands). The Kaiser Repro Kid is a copy stand. Copy stands are for home use or simple use in a photo studio. A repro stand is for an atelier or a full-scale professional studio. The Kaiser rePRO is a repro stand, albeit entry level. Or you could consider the Kaiser rePRO as a high-end copy stand. The tti is a professional repro stand, as are the various Linhof reprographic systems. This is the Linhof reprographic copy stand at Photokina 2004. 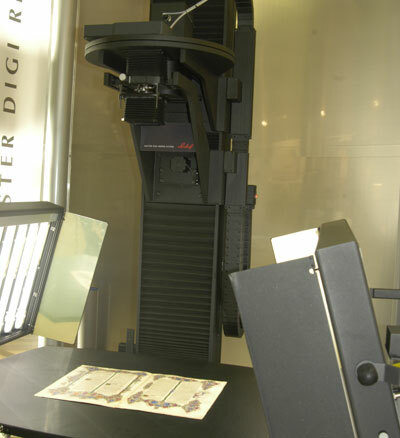 The most recent Linhof repro stand is the Linhof Master Digi Repro System, as shown at Photokina 2008. Earlier smaller systems were the Linhof RD 1 and Linhof Digi Repro. In the past the Linhof Technopro I and Technopro II were also available. But trying to put any heavy 4x5 or any other comparable view camera facing down is asking for both sag and something falling down eventually. There is absolutely no need to put an entire normal 4x5 camera up on a repro stand: the repro camera should be smaller and made specifically for being held precariously out on a repro stand arm. The Linhof RD 1 is certainly better than anything else in the same family. However most of the base boards (tables) are large enough to use for giclee or archival photography of old maps. The Kaiser rePRO stand table is a good example of being too small for the serious art reproduction business. Here the Cruse has an advantage of concentrating on the museum and giclee applications. In North America the excellent Linhof studio equipment and high quality Anagramm digital scan backs are not well known. The Linhof distributor in America is not part of the giclee or museum world, but is remembered from the world of old-fashioned 4x5 film cameras of the last century. As a result of the distribution philosophy in America, the excellent Linhof copy stand equipment will have a challenge in North America to gain market share against Cruse, BetterLight or even tti (Tarsia Technical Industries). But in Europe Linhof has more opportunity to maintain market share and increase market share. I would prefer a Linhof RD 1 or Linhof Techno against any cheaper Japanese studio camera or any lesser brand of European camera. I would consider the Linhof on par with Cambo and Sinar, albeit more conservative than these and less adventurous than Arca-Swiss, which despite being Swiss has developed new products every few years that break out of the mold of old-fashioned film cameras of the previous century. In the USA the premier tri-linear scanning back is BetterLight. The leading reprographic stand is the Cruse system (German-made but with dealers throughout USA). Both of these brands have been part of the FLAAR digital photography evaluation system for many years (FLAAR has been beta-tester for BetterLight since 1997 and for Cruse since about 2001). As a result over a quarter of a million photographers a year can learn about the BetterLight and the Cruse from the comprehensive coverage of the FLAAR Reports. Since we do not have any Anagramm and no recent Linhof camera equipment, there are no FLAAR Reports on either of these brands, though we do intend to begin evaluating Anagramm scanning backs in 2009 since their new marketing manager has a modern progressive outlook. Most Linhof studio cameas have L-shaped structures which are not rigid enough to support the weight of a scanning back (I have two Linhof cameras, a Technikardan and a top of the line Linhof 8x10 studio system). The only advantage of the Technikardan is being portable (once you can figure out how to fold it up without damaging the bellows). First Linhof developed a more robust camera to holid a digital back, the Linhof RD 1 Reproduction Camera. I would need to have hands-on experience before I could make any statement. But any flop-down, flip-up camera may not be immediately convincing (too many joints to wobble). 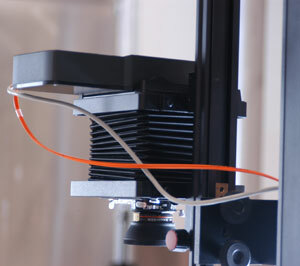 I would prefer a repro camera that is totally rigid except the bellows and its path. A nice new Linhof camera, more flexible in terms of being usable outside the studio, would be the Linhof Techno. This is portable and can be used outdoors. I especially like it’s ability to use lenses from the Franke & Heidecke Sinar Hy6 and Leaf AFi Rollei-based system. First posted after Photokina 2008.